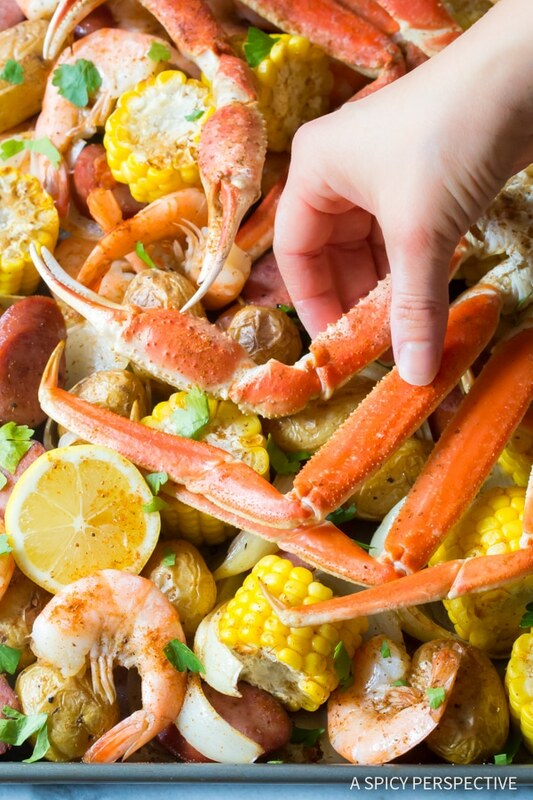 Amazing Sheet Pan Low Country Boil (Broil) – A great way to cook your southern seafood for summer! I love an old fashioned Low Country Boil. Traditionally prepared in big pot filled to the brim with corn, potatoes, seafood and spice, the finished product is often dumped out on a newspaper covered table for casual enjoyment. 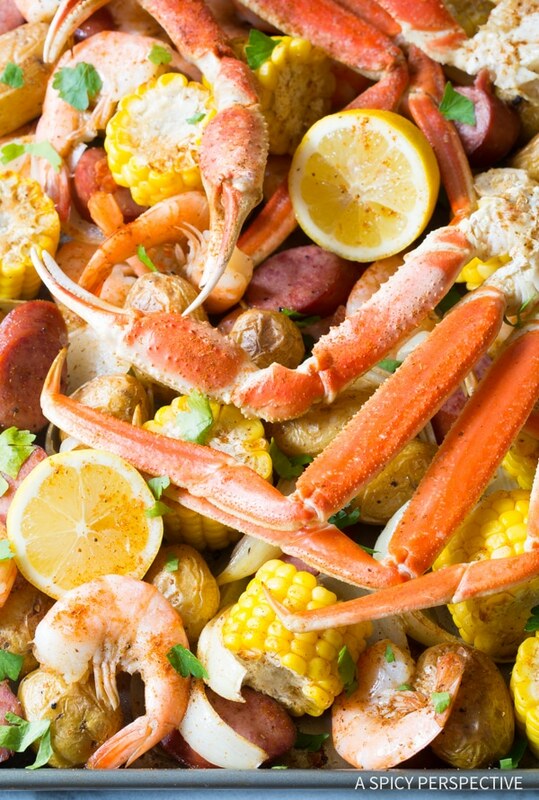 Low Country Boil is usually made one of two ways… It’s heavily seasoned and steamed in a large kettle, for easy table dumping. Or it’s cooked like a soup, and either ladled out of the broth, or served in soup bowls with the broth. Both ways are fantastic. However this season I thought it would be fun to cook a Sheet Pan Low Country Boil (Broil) in the oven. 1) Well, not everyone has a giant stock pot, or multiple stock pots, for large-batch party cooking. Yet most people have multiple rimmed sheet pans. 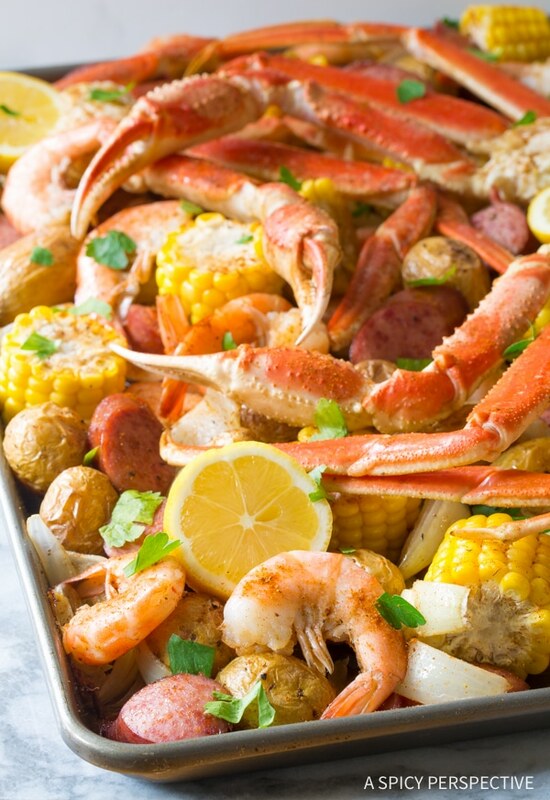 2) You make less of a mess in both serving and eating Sheet Pan Low Country Boil, than with the traditional method. Another reason it’s perfect for parties! 3) When you steam or boil the ingredients, everything comes out with a similar texture. Yet when you roast the ingredients, the potatoes skins are slightly crispy, the shrimp are tender yet firm, and there’s just a lot more textural diversity. 4) Most cooks like to keep their kitchens as cool and steam-free as possible in the summer months. Roasting Sheet Pan Low Country Boil (Broil) in the oven, means you don’t have to stand over a boiling stockpot. 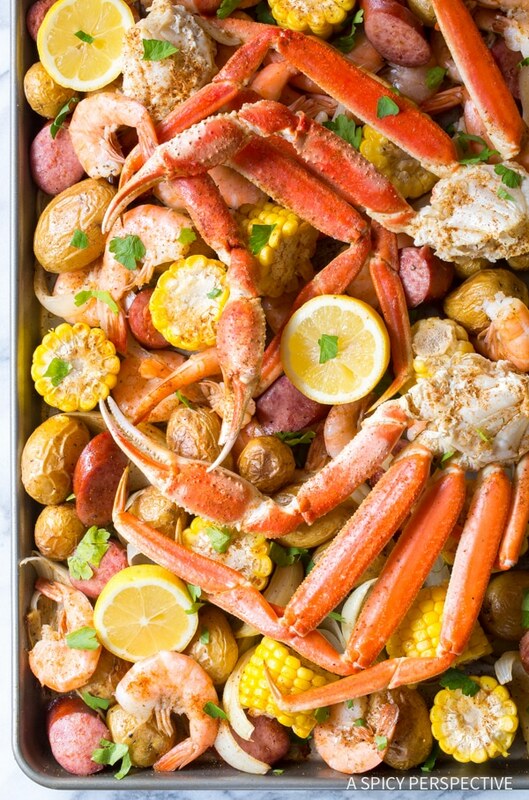 Sheet Pan Low Country Boil (Broil) is one of my favorite recipes for spring and summer parties. One pan feeds six to eight people. Yet for larger gatherings you can prep and cook several sheet pans all at once! Even left on the sheet pans, the presentation is glorious. 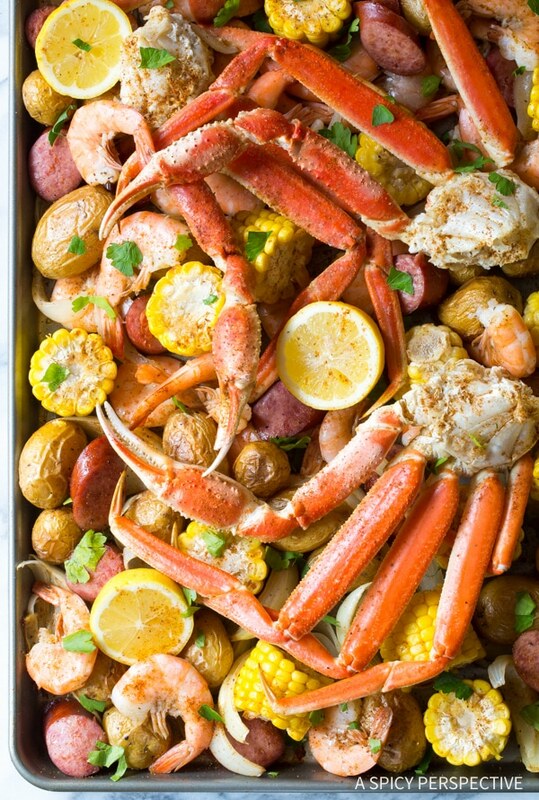 Piles of pink shrimp, succulent crab legs, kielbasa sausage, potatoes, onions and corn, dripping with butter and spice. Who can resist? Plan ahead. I usually make my meal plan and grocery list three or four days ahead, so I have time to add things as I remember them. Shop smart. We all hate to waste money, right? 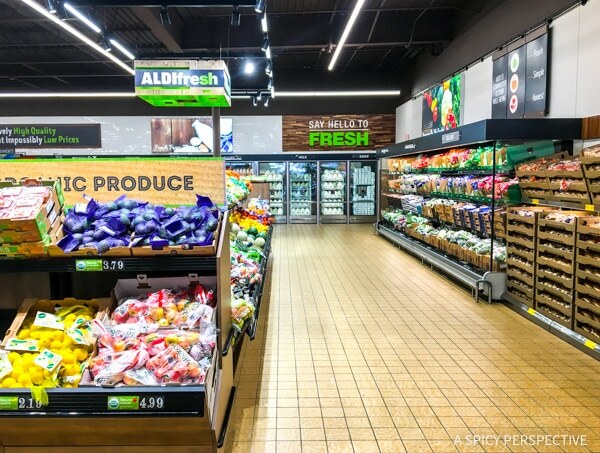 You can find nearly everything you need for a party at ALDI at a significant discount. 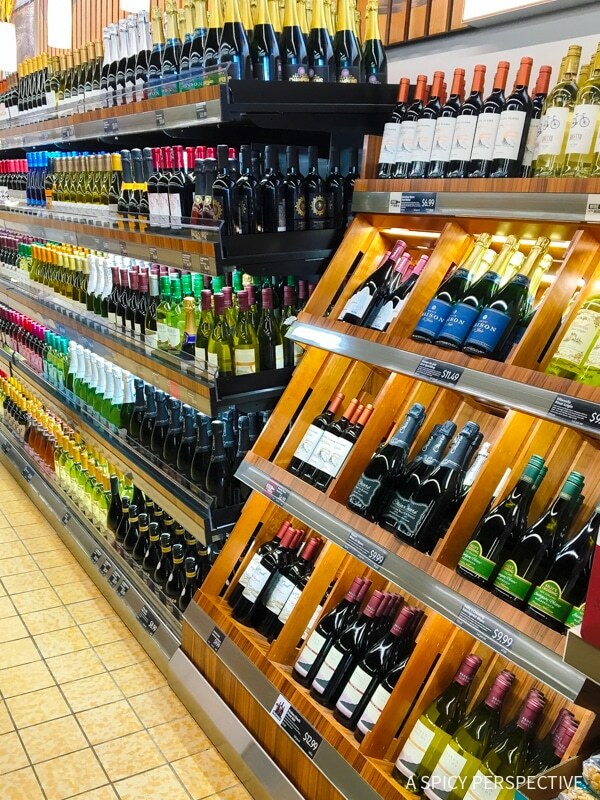 Wine, beer, produce, Cheese, Dips, protein for grilling, spices, baking ingredients, you name it. 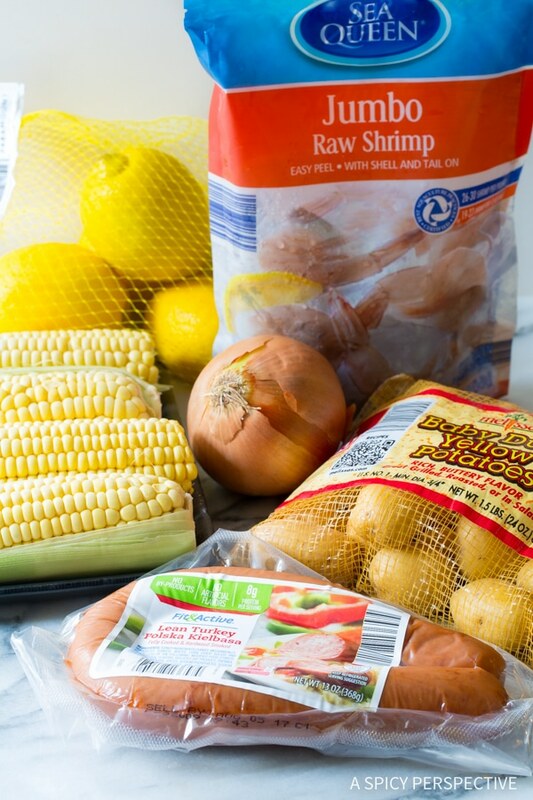 In fact, I found the ingredients for this Sheet Pan Low Country Boil at ALDI, including the crab legs! You will save so much money at ALDI, you can afford to invite more people to your event. Cook ahead. Normally I make the main dish the day of the party, so it is as fresh as possible. However, I usually plan easy side dishes, desserts, and even beverages I can make the day before. That way, I can enjoy the cooking process and am not stressed when my guests arrive. Be flexible. When it’s all said and done, you want to have fun at your own gathering. Even if you clean your house, set out stunning decorations, plan games and entertainment, and cook the perfect meal, there still might be a little bump along the road. Having the right mindset (i.e. not expecting perfection) when party planning allows you to go with the flow when guests show up late and bring tag-alongs. Or when uncle Larry drops red wine down grandma’s back. Over the years, I’ve learned a sense of humor is the most important element of hosting a fabulous party. 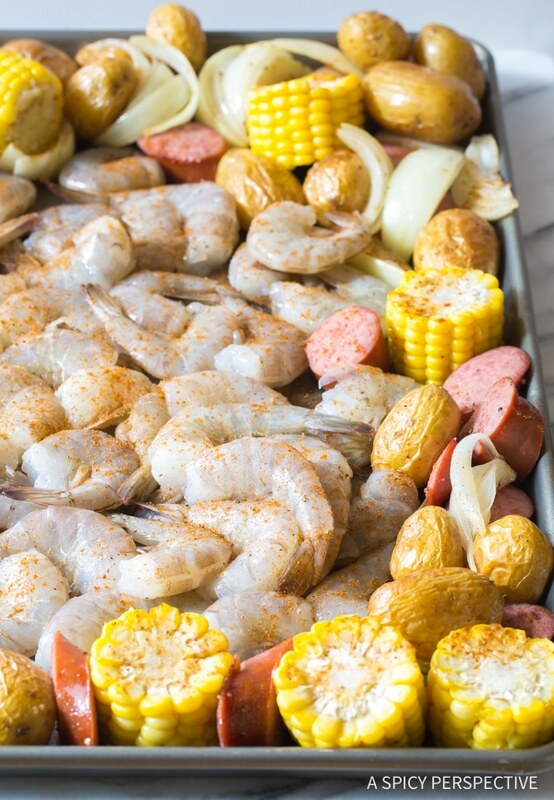 Amazing Sheet Pan Low Country Boil (Broil) Recipe - All the intrigue of a classic shrimp boil, roasted on a baking sheet for better texture! Preheat the oven to 450 degrees F. Line a large rimmed baking sheet with parchment paper. Place the potatoes on the baking sheet and drizzle with oil. 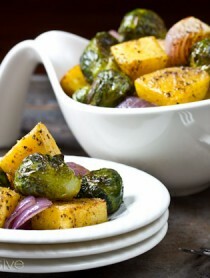 Salt and pepper, then roast in the oven or 20 minutes. Meanwhile, cut the sausage into 1/2-inch slices. Slice the onion into 1/2-inch wedges. Cut each ear of corn into 4 pieces. 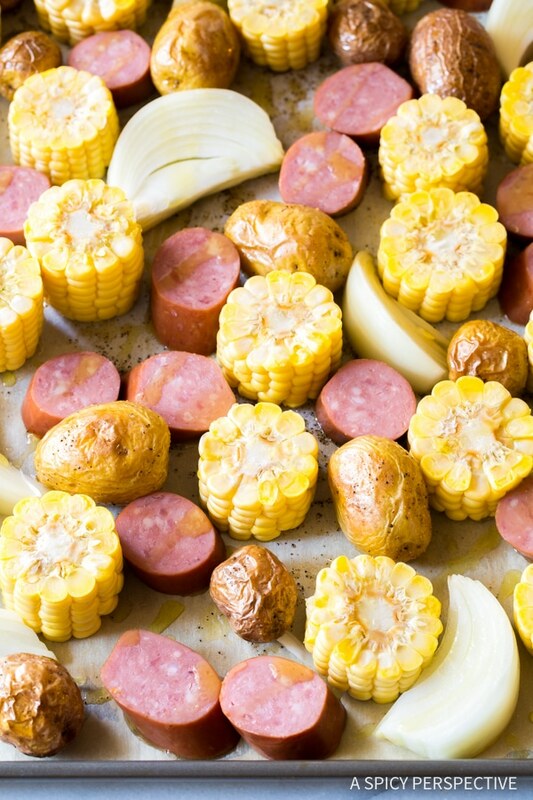 After the potatoes have roasted, add the sausage, onions, and corn to the sheet pan. Sprinkle with Old Bay seasoning and place back in the oven for 10 minutes. Move the sausage and veggies to the sides of the sheet pan. Spread the shrimp across the middle of the pan in a single layer. Sprinkle with Old Bay Seasoning. Then lay the crab legs across the shrimp. Place back in the oven for approximately 5 minutes, or until the shrimp are pink. Remove from the oven. Drizzle the entire pan with the juice of half a lemon and melted butter. Toss to coat. Then garnish with parsley and extra lemon. NOTES: All brand names listed in recipe come from ALDI. Talk about a good way to kick off the summer! This is wonderful! 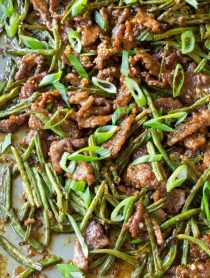 Maybe a perfect dish for memorial day weekend?! I love this! Haven’t had a low country boil in forever! 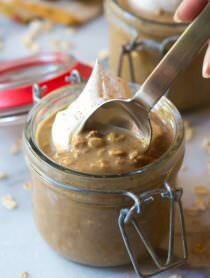 Such a greta recipe for the summer! I love how easy sheet pan meals are! This looks delicious! Everything good on one pan!